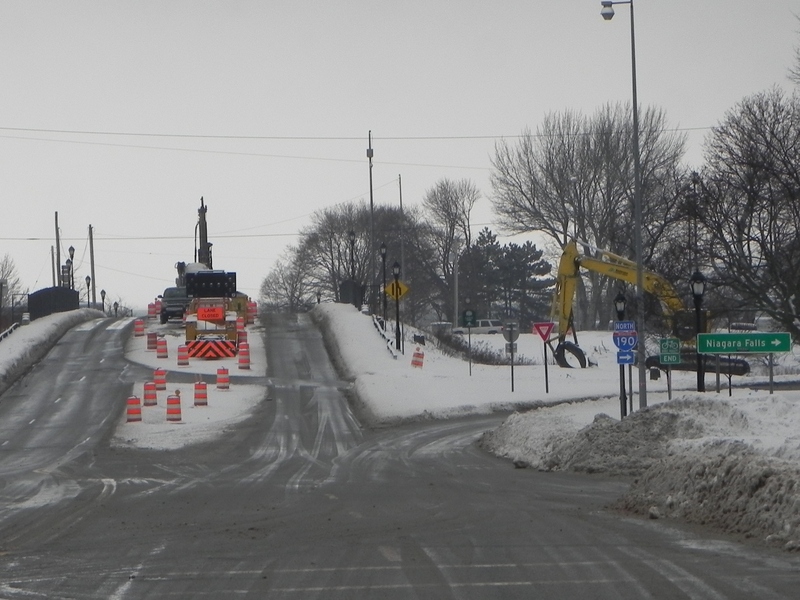 My clients, six Columbus Parkway families whose homes are a short distance from the Peace Bridge and its persistent traffic, had one desire when they filed their lawsuit last September 2014 in State Supreme Court. [See, Mecca et al. v. Empire State Development et al., Supreme Court, Erie County, Index No. I 2014000160.] They clearly understood that there was no guarantee that their legal claims would prevail. All they wanted was a prompt, fair, and thoughtful review by the court of the legality of the decision-making processes used by two NY state agencies and the City of Buffalo regarding Peace Bridge-related projects that were being fast-tracked by the Cuomo administration. They wanted to feel as if justice was being done. They never got to experience that feeling. While there was an encouraging court proceeding on October 2, 2014, where the Hon. John F. O’Donnell, Supreme Court Justice, listened attentively, asked informed questions relating to motions to dismiss filed by the State and City respondents, and promised a decision “as quickly as I can,” what followed was disheartening. There was no “quick” decision. Despite a court rule [CPLR 2219(a)] that requires a judge to render a determination on a motion “within sixty days, after the motion is submitted for decision,” Justice O’Donnell’s “Memorandum” dismissing the residents’ “Article 78 petition” was issued on March 31, 2015 – just two days shy of the six-month anniversary of the October 2nd court proceeding. In reviewing a petition of this nature, the court’s role is limited to determining whether an agency identified the relevant areas of environmental concern, took a hard look at them and made a reasoned determination [legal citations omitted]. Petitioners’ claims are generally conclusory and/or speculative. Little detail is provided that could lead a court to determine that respondents have not taken a hard look at environmental concerns and made reasoned determinations. In fact, respondents’ submissions lead to a different conclusion. Petitioners make much of the fact that certain members of respondents [sic] boards displayed an arrogance, a misunderstanding of the duties of public servants, and attempted to avoid transparency. While the court agrees those actions (and comments) were reprehensible, those alone are insufficient to conclude a few small minded individuals were able to avoid their principal’s lawful obligations. Central to the residents’ legal claims is the argument that state and city officials have steadfastly devised “strategems” to avoid examining the cumulative environmental and health impacts on the adjacent residential community of proposed bridge and plaza enhancement projects. That pattern was first observed fifteen years ago by then-State Supreme Court Justice Eugene M. Fahey (appointed in February 2015 to the state’s highest court) at the time a second international span was under consideration at the Peace Bridge. In the words of Justice Fahey, the government decision-makers were engaged in “strategems to avoid the required environmental review,” and had “strained mightily to avoid the commonsense conclusion” that traffic flow over the Peace Bridge “is acutely dependent on traffic flow through the current or any proposed new plaza.” Accordingly, Justice Fahey found that New York’s Department of Environmental Conservation (DEC) and the Buffalo and the Fort Erie Public Bridge Authority – known informally as the “Peace Bridge Authority” (PBA) – had violated their obligations under SEQRA (New York State’s Environmental Review Act) to avoid the “segmentation” of the environmental review process, and to take a “hard look” at the cumulative impacts of the bridge and related plaza/connected roadways projects. Note: Justice Fahey’s opinion was rendered in April 2000 in response to two consolidated cases, Matter of City of Buffalo v. New York State Department of Environmental Conservation et al., and Matter of Buffalo Olmsted Parks Conservancy, Inc. et al. v. Buffalo and Fort Erie Public Bridge Authority et al., 184 Misc.2d 243, 707 NYS2d 606 (Sup. Ct., Erie Co. 2000). The pleadings dismissed on March 31st by Justice O’Donnell alleged that the April 25, 2014 actions and comments of Cuomo Administration appointees at a meeting of the board of the PBA board reflected the current version of the “strategems” criticized in Justice Fahey’s 2000 court decision. [See August 6, 2014 Buffalo News article, “Plotting at the Peace Bridge.”] The two main actors on behalf of Gov. 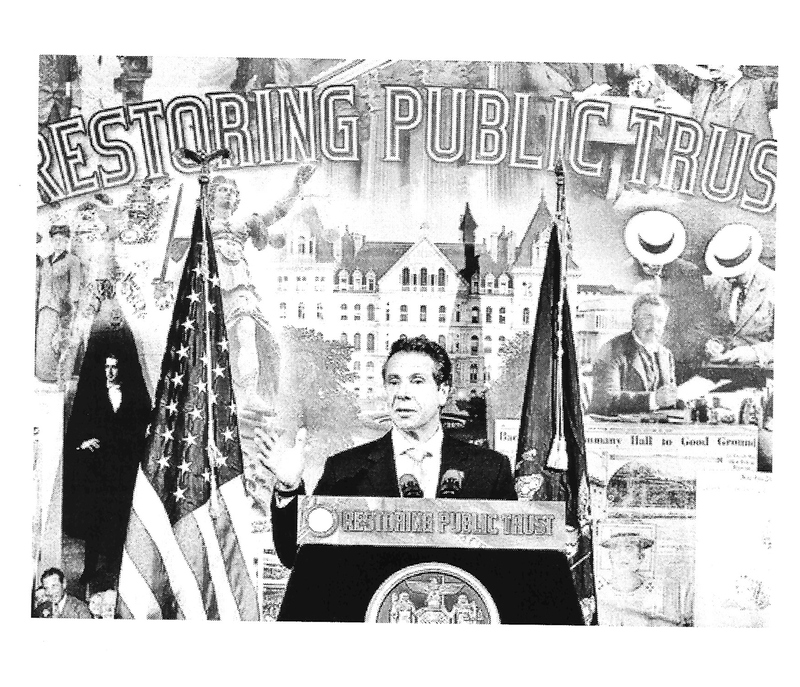 Cuomo were Maria Lehman, P.E., who at that time held the title of “New York State Program Manager for the Peace Bridge,” and Sam Hoyt, who then served Andrew Cuomo as chairman of the PBA board and president of Empire State Development’s Western Regional Office. 49. A spirited discussion dominated by the State’s Program Manager for the Peace Bridge, Ms. Lehman, during the aforementioned April 25, 2014 Peace Bridge Authority meeting details the stratagems implemented by the State of New York and respondent City of Buffalo to avoid the delays that would accompany demands that the City of Buffalo fully and objectively assess the cumulative impacts of the various Peace Bridge expansion and enhancement projects: keep the public uninformed of the decisions being made, and circumvent any member of the City of Buffalo Common Council who might demand a full environmental study. Rather than viewing the transcript of the words uttered on April 25, 2014 (set forth at paragraph “50” of the Verified Petition) as the proverbial “smoking gun” confirming petitioners’ allegations, Justice O’Donnell inexplicably minimizes the role played by Ms. Lehman – New York’s “Program Manager for the Peace Bridge” – and Mr. Hoyt – who, as both chair of the Peace Bridge Authority board and head of WNY’s Empire State Development office, was often viewed as the Governor’s the governor’s “eyes and ears upstate”. No two individuals were in a better, more influential position to implement the Cuomo Administration’s policy to fast-track Peace Bridge projects, regardless of the human and environmental costs. Note: As noted at the end of paragraph “50” of the residents’ petition, excerpts from the audio tape of the PBA’s April 25, 2014 board meeting – obtained by the Washington, D.C.-based advocacy group, Public Employees for Environmental Responsibility (PEER) – are available at https://www.youtube.com/watch?v=MKN-B8vtLww&feature=youtu.be and https://www.youtube.com/watch?v=o4vpPHZnEKk&feature=youtu.be. According to SEQRA regulations, a governmental agency is obligated to consider “cumulative impacts” of other simultaneous or subsequent actions “included in any long-range plan of which the action under consideration is a part.” [See 6 NYCRR 617.7(c)(2).] In other words, the decisive factor in determining whether the cumulative impacts of other pending or proposed development must be assessed “is the existence of a ‘larger plan’ for development.” The Peace Bridge neighbors argue in their court papers that the “Peace Bridge Understanding” – announced by Gov. Andrew Cuomo on June 25, 2013 – constitutes such a “larger plan” for the Peace Bridge, its U.S. plaza, and the various roadways and ramps leading to it, and triggers an obligation under SEQRA for the State of New York and the City of Buffalo to objectively assess the “cumulative impacts” of the various expansion and “enhancement” projects on the environment and on the health of nearby residents. Justice O’Donnell’s decision dismissing my clients’ lawsuit never mentions the “Peace Bridge Understanding,” or the issue of whether a larger plan exists mandating consideration of the cumulative impacts of the various Peace Bridge-related projects in progress or under consideration. It is impossible to know whether the court was referring to this issue when it states: “Petitioners’ claims are generally conclusory and/or speculative.” There is no doubt that the repeated assertions by respondent NYS Department of Transportation that its “New York Gateway Connections Improvements Project to the U.S. Peace Bridge Plaza” is not part of a larger plan, and by the Cuomo-dominated Empire State Development Corporation that there are “no current plans” to utilize the Episcopal Church Home site for plaza expansion, are conclusory. Therefore, despite the proof provided by the petitioners of the existence and contents of the “Peace Bridge Understanding,” neither the respondents, in the numerous affidavits and affirmations they submitted to the court, nor Justice O’Donnell, in his written decision, bothered to acknowledge its existence. Various stratagems employed by respondents have resulted in a failure to take the “hard look” mandated by SEQRA at the long-term, direct, indirect, and cumulative impacts of existing and future Peace Bridge traffic on the quality of air breathed by petitioners, their respective families, and their Lower West Side neighbors, and the effect of that air quality on the short-term and long-term health and wellbeing of petitioners, their respective families, and their neighbors. A number of the individual petitioners, as well as members of their immediate family, suffer significant health problems, including chronic asthma, bronchitis, sinus infections, environmental allergies, and other serious illnesses. As was reported in May of 2013 by Investigative Post (a non-profit investigative reporting center that focuses on issues of importance to Buffalo and the Western New York community), a strong body of evidence exists linking Peace Bridge traffic pollution, especially diesel fumes, with high asthma rates and other respiratory ailments among the residents in petitioners’ Lower West Side neighborhood. 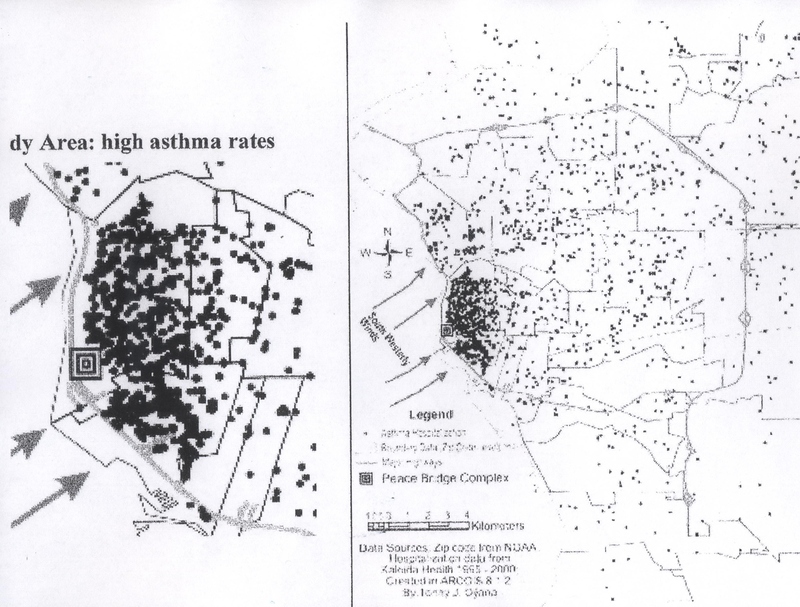 A copy of Investigative Post’s report, entitled, “Asthma plagues Peace Bridge neighborhood – Scientific studies link bridge pollution, especially from diesel trucks, to high asthma rates on Lower West Side,” is attached hereto as Exhibit M.
– One-third of residences on the Lower West Side of Buffalo have at least one person with asthma. – A quarter of the students at the school closest to the Peace Bridge have been diagnosed with asthma, the highest number in Buffalo. – The number of respiratory cases decrease by as much as seventy-five percent (75%) when the 9/11 terror attacks resulted in a significant drop in Peace Bridge traffic. The court’s failure to acknowledge these concerns is troubling, at best. While the first three claims raised in petitioners’ court papers involve violations of SEQRA, their fourth and fifth claims have nothing to do with the environmental review process. Overlooked or, perhaps, forgotten with the passage of nearly a half-year between the date of oral argument and the issuance of the “Memorandum,” are the petitioners’ allegations that the City of Buffalo Common Council adopted resolutions in furtherance of the DOT’s Gateway Project without first complying with procedures mandated by the City Charter, and in violation of the State’s Open Meetings Law. 51. Consistent with the words expressed by Maria Lehman at the PBA’s April 25, 2014 board meeting, procedures were followed by respondents NYSDOT and City of Buffalo that had the effect of limiting the information available to the public concerning the status of NYSDOT’s efforts to obtain ownership of Baird Drive and various easements needed to progress the Gateway Project, and of restricting the ability of any member of the City of Buffalo Common Council to oppose U.S. plaza expansion plans or demand a full environmental study. More than 20 years ago the Legislature enacted SEQRA, and by so doing formally recognized that environmental concerns should take their proper place alongside economic interests in the land use decision-making processes of State and local agencies (see, ECL 8-0103; 6 NYCRR 617.1[d] ). To insure that this laudable goal would be accomplished, the Legislature created an elaborate procedural framework requiring parties to consider the environmental ramifications of their actions “[a]s early as possible” (ECL 8-0109 ) and to “the fullest extent possible” (ECL 8-0103 ). The mandate that agencies implement SEQRA’s procedural mechanisms to the “fullest extent possible” reflects the Legislature’s view that the substance of SEQRA cannot be achieved without its procedure, and that departures from SEQRA’s procedural mechanisms thwart the purposes of the statute. Thus it is clear that strict, not substantial, compliance is required. Nor is strict compliance with SEQRA a meaningless hurdle. Rather, the requirement of strict compliance and attendant spectre of de novo environmental review insure that agencies will err on the side of meticulous care in their environmental review. Anything less than strict compliance, moreover, offers an incentive to cut corners and then cure defects only after protracted litigation, all at the ultimate expense of the environment. 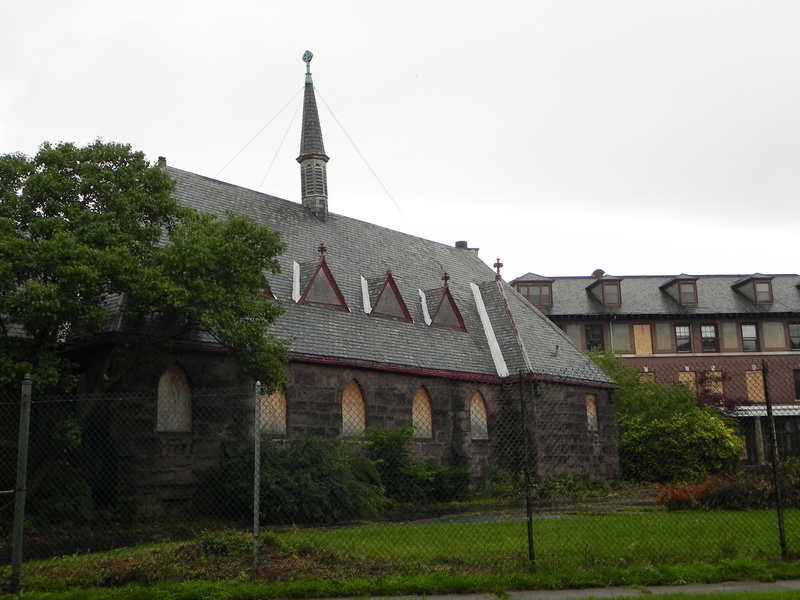 By issuing a “Negative Declaration” on June 30, 2014, rather than requiring preparation of an Environmental Impact Statement regarding plans to demolish the structures on the Episcopal Church Home parcel across the street from the Peace Bridge, respondent Empire State Development eliminated the public’s opportunity to participate in the environmental review process. Then, consistent with the strategy expressed by the State’s Peace Bridge Program Manager, Maria Lehman, on April 25, 2014, the State agency successfully delayed the public’s knowledge of its decision not to prepare an Environmental Impact Statement by failing to promptly file its notice of non-significance (“Negative Declaration”) with the State’s DEC for publication in the “Environmental Notice Bulletin” (ENB). The SEQRA regulations, found at 6 NYCRR 617.12(c)(1), required publication of Empire State Development’s notice of its Negative Declaration in the ENB. On September 17, 2014, seventy-nine days after issuance of the Negative Declaration, Empire State Development had still not taken steps to comply with this requirement. 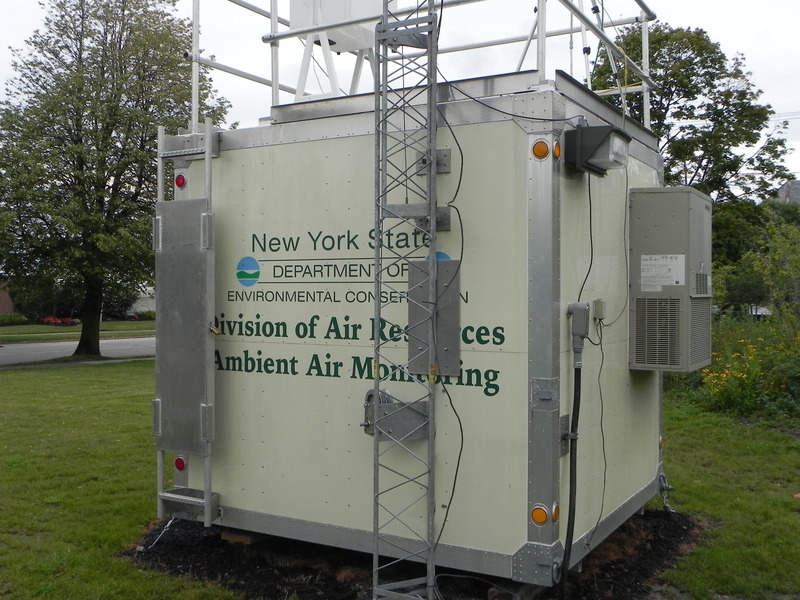 Given a lead agency’s obligation to strictly comply with SEQRA’s procedural mandates, this violation alone was adequate grounds for the court to nullify Empire State Development’s environmental review and approval to proceed with the Episcopal Church Home abatement and demolition project. Justice O’Donnell’s written decision makes no mention of this issue, allowing the State respondent to flaunt its obligations to comply with the letter and spirit of SEQRA. 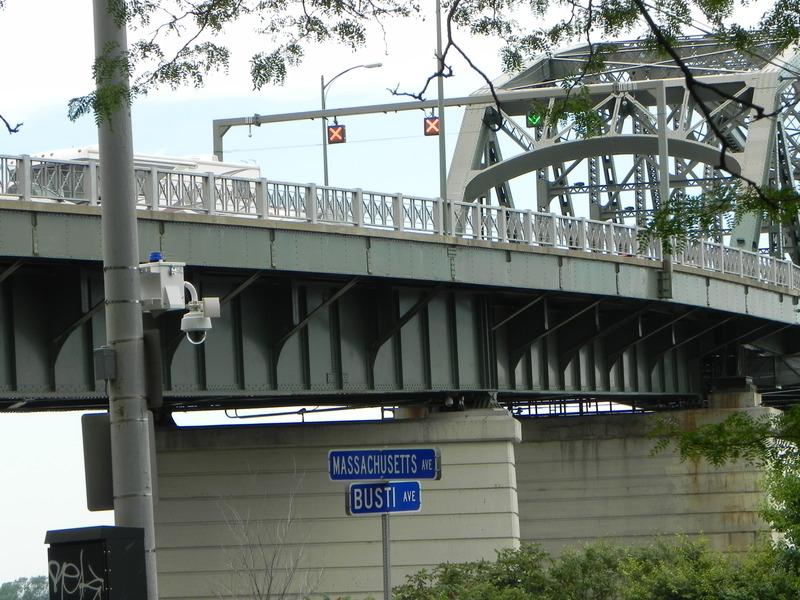 Buffalo’s Lower West Side has long suffered from its proximity to the Peace Bridge and the resulting air pollution that is generated by the traffic utilizing the international span. Not surprisingly, given the percentage of this community’s residents who are members of a minority group, or who have household income below the federal poverty level, my clients’ neighborhood is designated a “Potential Environmental Justice Area” by the State of New York. The Columbus Parkway residents I proudly represented in Mecca et al. v. Empire State Development et al. have long ago concluded that the local, state and federal officials who have the power to remedy the adverse health impacts associated with Peace Bridge traffic lack the will, courage, and/or compassion to objectively and effectively address the issues. They turned to the State court system in search of justice. They did not find it.